Improve your visibility on App Store & Google Play and boost downloads! More Downloads. More Revenue. More Business. What is ASO? How can it help my business? How should it be done? How to track and improve it? App Store Optimization (AKA ASO or App Store SEO) is the process of optimizing a game or application in order to maximize its visibility in the Apple App Store, Google Play Store or other markets in Search (when users search on the app stores), Top Charts, and Featured, boost traffic to listing and improve conversion rate to generate the maximum volume of organic downloads. App Store SEO brings free high-quality users to your Android or iOS app and is the base of any Mobile Growth strategy. This process requires a critical understanding of how the stores work, the target user base, and the most relevant keywords potential users are typing or speaking to find apps or discover new ones. Don’t get confused: App Store Optimization is not the same as SEO for mobile apps! App Store Optimization is a never-ending optimization process that can bring you millions of free downloads. ASO is an essential part of App Marketing strategy for any mobile business. If you haven't started yet, do it now! On-metadata factors are those elements of product page can be modified within iTunes Connect or Google Play Developer Console in order to optimize keywords rankings within the App Store or Google Play and to encourage the user to download. These elements, that are 100% under our control are: URL / Package (only Google Play), Developer name (only Google Play), App Name / Title, description, short description (only Google Play), keywords field (only Apple), category, icon, screenshots and video. Optimizing on-metadata will help you rank higher in App Stores Search. As it happens in SEO (Search Engine Optimization from web marketing world) and off-page factors, Off-metadata factors are those external factors that are not under the control of the developer. Search plays a huge role in how users discover apps, with search queries accounting for 65% of downloads from the App Store. Picking the right keywords is crucial for Search success. You should target those with high relevance (related to your business), high traffic and low difficulty or competition. The keyword research process is different for each app. For example, for new apps, it’s better to use mid and long-tail low competition keywords to gradually change them with some with more traffic and competition. In order to get the maximum visibility, your app or game should be global (available worldwide) with all languages optimized. It’s all about optimization when it comes to improve visibility and Conversion Rates. Add keywords in the title (30 char), short description (80 char), description (4,000 char). Unlike Apple, Google indexes almost all text that appears in the store listing. Google Play, when it comes to Search, is much more similar to SEO. A/B test listing elements like icon (to increase CTR in lists), feature image or screenshots to boost conversion rate and get more installs with the same traffic. Is your product page ready? Let’s see it! Track all KPIs: keywords rankings and competitors’ rankings, track Top Charts rankings, organic installs (by country), conversion rate to install, revenue from organic installs (in-app, advertising…), and competitors’ updates / changes in listings (on-metadata). IMPORTANT: ASO for Apple App Store is not the same as for Google Play Store. Take a look at our ultimate guides! The most accurate and powerful App Marketing software. Try our 10-day FREE trial and start boosting your installs! The title is one of the first things that users see when they discover your app or game. Chose a name that is identifying your app and expresses its purpose. Your brand name should be simple and memorable – better stay away from generic names here. To compose a perfect title use this formula: Brand name + 2 or 3 of your most important keywords. These serve a double function – to give users an understanding what your app serves for, and to boost your rankings. App stores give most weight to the keywords included in the title, so make the most out of it! Keywords are the most important aspect of your Search strategy, and you should start working on them even before the day you launch your product. Do a keyword research, and get as many keywords and combinations that are related to your app and imply a download intent. Also, do a market research to study competition in Search. Besides Title, add keywords to the URL of the page (package Google Play), short description (Google Play), and in the description (Google Play). Important: Google Play indexes your full description, but App Store doesn’t. Get creative! This is your chance to outrank your competitors. Make your icon descriptive and clear for the users to understand what your app or game is about, check out what your competitors are doing, and make an icon which is striking and original. Work on your style and stick to it, keeping it through updates. Create a distinctive image for your app! Prior to implementing a change in the app page elements, test them using an A/B testing tool. Our advice is not to combine several changes at once, but separating and testing them one by one, so you can certainly understand which item benefits from the change. A blind translation doesn’t work here. When you are localizing your app for a different country, you are getting in touch with a different culture, with different search and behavioral habits. Even for the US and the UK english language there might be differences in spelling. When opening a new country for your app, adapt your text, provide screenshots in a different language, think of culture-specific engagement options. And if you decide to publish your app in a new country using an english version, think of how many people in this country actually speaks this language and if they will be eager to use your app in english. Bugs can cause a lot of negative reviews, and you don’t want that. Monitor and update your app frequently, and get your users to report bugs on a separate page, impide negative reviews from leaking to your download page. ASO is not about one-time optimization. Some of your competitor’s actions can make a big change in the market, so never stop monitoring and react timely on these changes. Or maybe you will be the first who shakes the market? In any case, track the situation in your niche daily with a tool and update your strategy frequently. 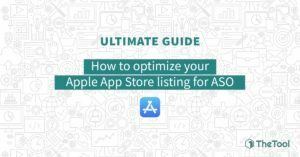 ASO -App Store Optimization- is the base of any Mobile App Growth strategy. Don’t underestimate its power and use it to increase app downloads!